I’ve been reading Reed Magazine for many years, and I decided you needed some feedback from the past! Really, I cannot list accomplishments inspired by my education at Reed. But I can send my appreciation to the school for the humanities program. That program has pursued me with a list of suggested reading over all these years: 1940–2017. My many thanks for that! To be sure, the introduction of that program was too fast-paced, too overwhelming for a naive freshman student! Since then, however, it has been a boon as a guide for stimulating reading material. In those days I was a “day-dodger”; studying was the order of the day. However, the highlights of the years were the weekend hikes. The one that stands out in my memory is the climb around Eliot Glacier on Mt. Hood. Being in the classroom as a teacher was the objective of my education. Thus, in the ’40s I ended up in a small coastal town surviving on a limited budget, and then eventually ending up in a sophisticated environment in the city. Yes, marriage was part of the picture, as was the rewarding experience of raising two sons. Now I relish the liberty of my retirement years, listening to recorded books here in Utah—where there is too much sunshine and not enough rain (and a dearth of book learning). My thanks to the humanities program at Reed! Thank you for your fine Hum 11(0) article. I did Hum 11 in ’55–’56. 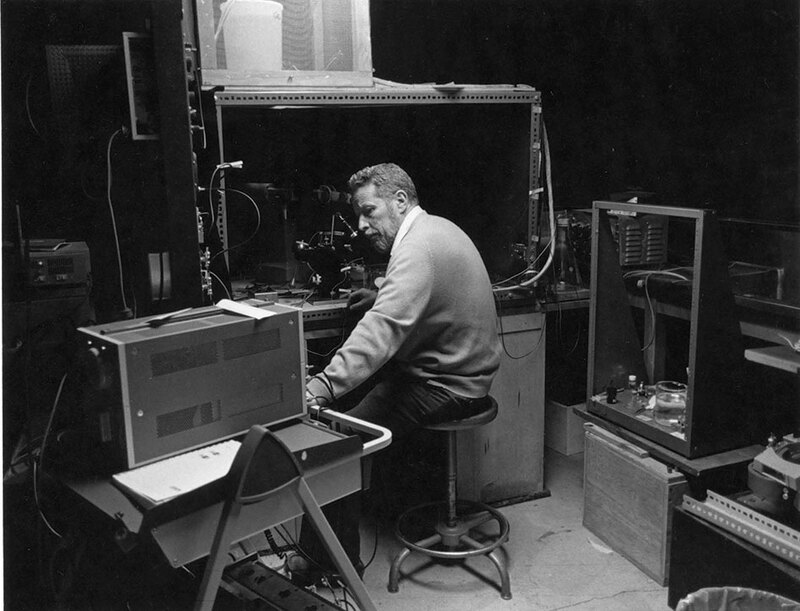 Prof. Rex Arragon [history 1923–62] was the course’s guiding light and inspiration in those days. Over the decades, I have often thought back upon the course. Two themes recur. First, it was the most important and, arguably, the best of all of the in-school education I have received. This I have always believed, even as early as my last three years at Reed. Second, as my anthropology career took me far afield from the avowed Western Civ orientation of Hum 11, I have come bittersweetly to hope that Hum 11(0) might somehow sample forager cultures and lifeways, how all humans lived for the first 95% of our species’ history because I have come to suppose that forager life ways embodied behavior, knowledge, and experience of unique value to humankind. Well, one might rejoin, packing another 100,000-plus years of the human career into Hum 11(0) is a pretty big order, isn’t it? Perhaps so, but should anyone be disposed to take a bit of a gander at this, may I suggest three books? From Reed’s own Prof. Robert Brightman ’73 [anthropology 1988-2016], Grateful Prey, Rock Cree Human-Animal Relationships; and from Hugh Brody (Canadian anthropologist, filmmaker, and advocate for native peoples), The Other Side of Eden, Hunters, Farmers, and the Shaping of the World; and Maps and Dreams: Indians and the British Columbia Frontier. Your article on Hum 110 in the March 2017 issue mentioned “the welsh [sic] epic Mabinogion.” It is not the uncapitalized “Welsh” (which I’m sure must be a typo) to which I am objecting. It’s to both “epic” and “Mabinogion,” particularly as a collocation. Please allow me to explain. “The Mabinogion” is a handy, but incorrect, term coined in the 19th century (based on a single scribal error), used as an overall title for a collection of eleven medieval Welsh prose tales found more or less together in two late-medieval manuscripts. These tales do not all go together in any meaningful way. They are totally separate, distinct texts, written at different times, by different people, on different topics. This does not—of course—constitute an epic. I don’t know whether the Hum 110 team read the whole “Mabinogion” corpus of eleven tales, or only the four which properly bear the name (sort of). Let me explain this too. Within this collection of eleven is a group of four tales known to Celtic studies scholars as “The Four Branches of the Mabinogi” (note: not “Mabinogion,” a bogus plural) which do go together and were probably written by a single author, although how exactly the discontinuous narratives are supposed to connect is a matter of considerable dispute. The “Four Branches” are also not an epic, in any sense of the term. They are four medium-length prose tales that have a few overlapping characters: no epic central protagonist, no heroics, no grand sweep of action or history. They are skillfully and beautifully written, with sharply witty dialogue, a serious concern for matters of good kingship and proper conduct, and some tantalizing shadows of pre-Christian myth, but they are scarcely more epic than Jane Austen. Nevertheless, I’m glad that Hum 110 has featured these tales, even if it was only once. I did my PhD dissertation on “The Four Branches.” Medieval Welsh literature has been my research area ever since. More students should be exposed to it. But there is no Welsh epic. When I applied to Reed from a small semiprivate school in Vermont, I said I definitely wanted an interview; when I learned the interview would be at Phillips Exeter Academy all the way across New Hampshire, and that acting dean of admission Alice Jones (Prof. Richard Jones’s [history 1941–86] wife) would not be conducting interviews that day, I was disappointed. Instead, I was told, a Reed faculty member, David Tyack, would be the interviewer that day. How little imagination I had! The switch in interviewers definitely worked to my advantage: It turned out I was the only female he interviewed (making me memorable at least for that); he also was familiar with my small school (a Harvard classmate of his, scion of a family my parents knew well, came from the town where the school was located). Not only did he apparently recommend I be admitted, but we became close friends at Reed. He sang in the Madrigal Group, as did I. He hired me as a babysitter for his two young sons. His enthusiasm and encouragement was a major factor in my decision to apply to Reed’s Master of Arts in Teaching program when I graduated. Later, when I was indeed teaching and one of my brothers was visiting, Dave took us on a memorable mountain-climbing excursion. (When he moved to the University of Illinois, he wrote he had taken to going into old mine shafts so he would have something to climb!) Later he taught at Stanford; I visited the family there. At some point I gave Dave a copy of the official history of my high school alma mater, Thetford Academy; he reciprocated with a copy of one of his books on the history of education. What inspired me last fall to take that book off one of my bookshelves I do not recall (in the process I was reminded that I had more than one of his many books). Tucked inside the first book were several letters Dave wrote me when I was teaching in Germany, trying to figure out what to do with my life. Rereading those reminded me what an influential and supportive friend he had been, even though I never actually took a course from him. When I learned that he had died exactly a month before this nostalgic excursus of mine, I wished I had stayed in better touch. This letter is the best I can do by way of paying belated tribute to one of the Reed faculty who made a big difference to me. Frank Gwilliam was not only my thesis advisor but was also instrumental in my navigating the vicissitudes of my senior year at Reed. I probably never thanked him adequately. A dedicated teacher, Frank reached out to his students. Having spent a sabbatical year teaching at the University of Aberystwyth, Frank brought Wales to Reed through his annual celebration of St David’s Day: students bearing even remotely Welsh names arrived on March 1 to find a bunch of daffodils or leeks pinned to their thesis lab door, commemorating Wales’s patron saint. Frank’s humor brightened many rainy days. Complaining that his doctor advised him to grow taller or to lose weight, he noted that being unsuccessful in the former, he begrudgingly was attempting the latter. At the same time, I was struggling with my thesis. A pact was drawn up. I would finish my thesis, Frank would continue to lose weight; at the end, he would sign my completed thesis on the summit of Mt. Hood. I wish I could find the photo of Frank, in his orange parka (this was 1973) signing my thesis on the summit of Hood. That spring and summer Frank and I hiked in the Columbia Gorge. Watching me shed my jacket and then my hat Frank accused me of being a “lousy poikilotherm” an appellation I never received before or after. Such were the joys of hiking with a dedicated invertebrate zoologist. I was saddened to read about Frank’s death. I feel fortunate to have had him as an advisor and friend. 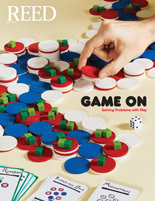 I want to share my reflections upon your recent editorial “The Contest” in the March issue of Reed Magazine. I found it amazing that in the same short piece of writing you could both ask people to “interrogate the authority of sources, weigh the evidence and reach their own conclusion,” and call out folks you disagree with as either lunatics or fanatics. I am struck that a smart person like you would be so undisciplined as to lump in an unwillingness to accept the dominant narrative of vaccine safety put forth by the CDC with a refusal to accept the data behind climate change. The vaccine issue is an absolutely perfect space for folks like you to sort through competing claims, interrogate the authority of sources, and reach your own conclusions—instead of name calling the thousands upon thousands of families questioning the sanity of a vaccine schedule in the United States that called for 5 total doses in 1962 versus 72 total doses today. And the vaccine issue is but one of many that deserve the intellectual discipline you demand. At the end of the day, if we are going to encourage people, as you do at the end of your piece, to go to unfamiliar places, then we better back up that request with demonstration. There is one driving question here—are you actively building and testing viable alternatives, or are you standing in ideology and the cult of rightness? The requirement today is to see—outside of right or left ideology—your real opponent, to build new structures, and to create the economic ecosystems of the future that are capable of building civic goods at a scale that serves people and planet. That is what we are doing with our company (Exile) and there are many like us around the globe. Editor's Note: What I actually wrote was: “Conspiracy theories that were once the domain of lunatics flourish on the internet like mushrooms in a woodpile.” For examples, just google chemtrails, hollow earth, or (tragically) the Protocols of the Elders of Zion. I also referred to “partisan fanatics who insist that the MMR vaccine is linked to autism and that global warming is a liberal fiction.” I’m sorry for the pejorative terminology, but both assertions fly in the face of scientific evidence. As you probably know, the panic over MMR and autism was set off in 1997 by a study of 12 patients by British surgeon Andrew Wakefield. A subsequent investigation concluded that Wakefield “chiseled” his data, relied on false medical histories, and was paid thousands of dollars by lawyers intending to sue vaccine makers. The journal retracted the article. Wakefield was stripped of his medical license. More important, several major studies have found no link—I repeat, no link—between vaccines and autism. If you have evidence to the contrary, bring it on! I agree that we need to rise above ideology. graphy. What is unique is the economy of effort traditional writing affords to low-tech recorded speech. Audio engineers are the contemporary equivalent. The handwritten letter is a couture response to content, and it ain’t necessarily the ruffles and flourishes writing masters used to lure students after Gutenberg automated their game. The pen point is the exact equivalent of the cutting stylus on a master recording device. Working consciously since 1952, I comprehend a writing tool as a musical instrument that can be played silently under any circumstances and writing itself as a subtly percussive exercise. Speed is a legitimate variable related to content. Traditional scripts remain legible when they decay under pressure of production. The content of a trained scrawl can be retrieved by repeating the gestures of the writer. The traditional sequence and direction of writing strokes are simple to learn and most valuable when circumstances are most demanding. Consider communicating with lumber crayon on the side of a building after a natural disaster: a decipherable message may be the only connection to one’s personal future. Renaissance italic military orders are far more legible than 19th-century copperplate commands. Faces and fonts are successive applications of the original written forms that are embedded in each iteration. Roman letters descend from handwritten models that evolved under varying cultural circumstances and are the oldest uninterrupted system of graphic indication available to humanity. I have enjoyed my share of letters that looked like waltzing pigs, but I have never seen a student who could be described as one. Thanks again for supplying the disdain that has been a crucial element of the calligraphic revival since its inception in the 19th century. Working with letterforms without knowing their history is like practicing medicine without knowing anatomy. I read with mounting fury the smarmy, overweening letter from an ignorant Reedie by the name of Butcher. What a shame that he did not avail himself of Lloyd Reynolds’s [English and art 1929–69] legacy of beauty, discipline, and awe! True, he must have come after Lloyd left, so he was unable to participate directly in or benefit from, his lively, broad-reaching classes, but it hardly qualifies him to judge so fiercely. 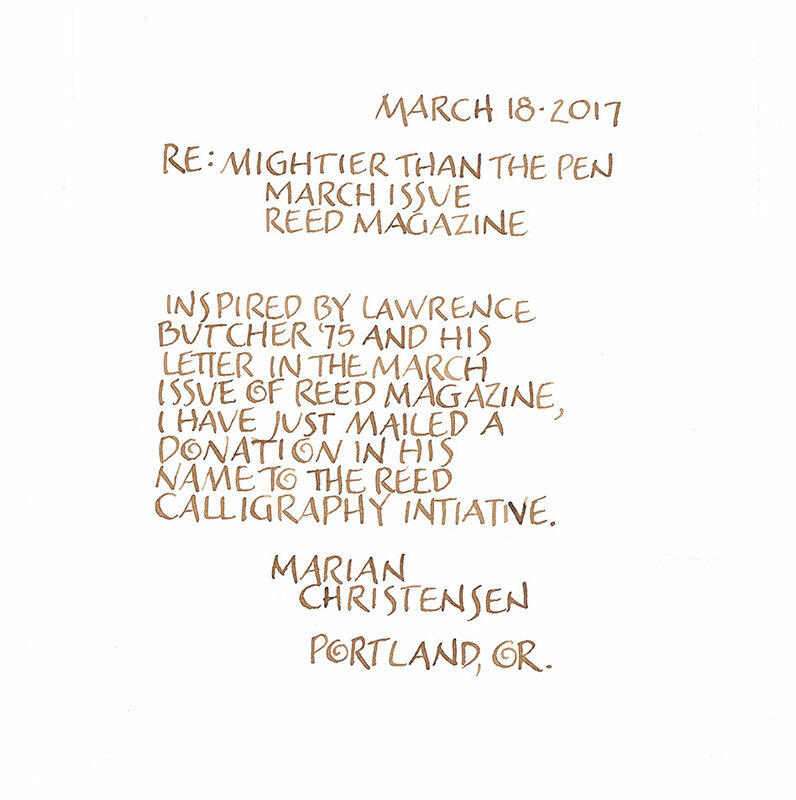 I came to Reed from the East Coast (and have lived in the Northwest ever since) because I had read Richard Neuberger’s article in the Saturday Evening Post that spoke highly of Lloyd Reynolds and his Graphic Arts Workshop. I wanted to study with him. Lloyd became my mentor and friend. After leaving Reed as a student, I was a photographer for Reed College publications for many years and saw the unifying effect of calligraphed signs all over campus. I also taught at Catlin Gabel and initiated the first italic writing program, grades 1–6, as a curriculum subject. We found that the children wrote with italic when they were proud of their work, and also they retained information better. If you write something, your eyes, mind, and fingers help you to remember. Since then, I have taught history through historic alphabets to students 6 to 66 years old, from short intensives to ongoing classes that sometimes continued for years—on a ship’s deck, in my studio, on kitchen tables, for arts organizations. Few of my students have become skilled calligraphers, it’s true, but all tell me how much it enriched their lives, awakened them to the ordinary, to unexpected beauty. So, keep up the good work, Chris! I understand Lawrence Butcher’s frustration with Lloyd Reynolds as a Reed superhero. I too began at Reed after Lloyd’s tenure, which ended in 1969. A while back, curious as to his popularity with Reed Magazine, I googled Lloyd to see what the fuss was all about. I can understand the fuss. Lloyd’s classes, available on YouTube, present a way of engaging with history from a vocational perspective. Writing was a privilege in the old days, and Lloyd’s classes remind us of that. Combine the importance of writing with a well-informed and gentle approach, and one can see the appeal of Reynolds’s classes. Far from being irrelevant, asking why Lloyd Reynolds is relevant to Reed is as Reed as Reed gets. Good question. 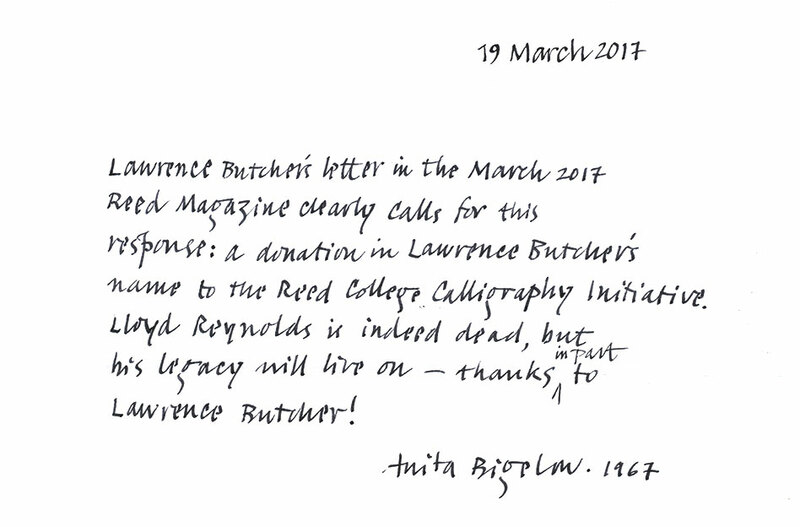 Lawrence Butcher complains that calligraphy has “utter lack of value to society.” Lloyd Reynolds’s teaching was not limited to calligraphy but spanned five thousand years of writing as the art and technology on which civilization is based. I studied with Reynolds in 1966–67, and my design partner, Kris Holmes ’72, studied with Robert Palladino, Reynolds’ successor at Reed, in 1970–72, and also with Reynolds. From what we learned from Lloyd and Bob, Ms. Holmes and I designed the Lucida digital typefaces that were long used in Apple’s OS X system user interface. Every day for 14 years, up to 80 million Mac users read and wrote with those fonts. We also designed Apple Chancery, based on Reynolds’s italic handwriting. Microsoft has distributed Lucida fonts with Windows and Office since the 1990s, around 2 billion of them over 25 years. Sun Microsystems distributed millions of Lucida fonts with the Solaris operating system and with software for Java Language developers. Lucida Math fonts are used for mathematical and technical publishing with the TeX system. At Reed, I studied with great professors, including David French [anthropology 1947–88], Gail Kelly ’55 [anthropology 1960–2000], and Richard Jones [history 1941–86]. Often I think of what I learned from them, whether reading Native American literature, pondering the anthropology of social media, or browsing the Histories of Herodotus of Halicarnassus, who wrote so that “things done by man may not be forgotten in time.” Yet, it was Reynolds’s teaching that gave me a fascinating career. If Mr. Butcher ever used Sun Solaris, Mac OS X, or Windows operating systems, he might have had to quit reading and writing had he realized that the fonts he was using came from Lloyd Reynolds’s teaching and calligraphy. I was pleasantly surprised to discover Lawrence Butcher’s criticism of Lloyd Reynolds in the March Reed Magazine. I had thought Lloyd’s reputation was so well established that he was beyond criticism. I took an art appreciation class from Lloyd in 1954. His theory was that art appreciation was all about lines, shapes, and balance—left-brain concepts. I thought then— and still do—that art appreciation is about what feelings the work expresses or what feelings the work intends the audience to feel. So in the major project to analyze 10 works of art, I discussed feelings. Lloyd gave me a D for the course. Such respect for an alternate point of view! But Lloyd was simply expressing what is wrong with Reed—the hopeless overemphasis on the left brain. The class of 1957 had 250 freshmen, and 73 of us graduated. Why? Because so many of us were emotional messes, even worse than me, who primarily majored in poker. Where does Reed feed our right brains? I’ve always thought that Reed needs something in the way of emotional support groups or encounter groups required of all students. As for Lawrence Butcher, because of his left-brain-only training, he doesn’t notice that calligraphy is beautiful. Once again, because of the trustees’ decision not to divest from fossil fuels, I am sending my annual contribution to divestfund.org in hopes that it will help persuade Reed of the seriousness with which some of its loyal alumni view this matter. Now more than ever, it is important to take a moral and environmental stand against the continued degradation of the world’s environment in the name of profit. The way we choose to invest funds is not neutral. It is immoral and counterproductive to profit from coal/oil and gas companies and practices that degrade the environment and contribute to climate change, to the further abrogation of Native American rights, and to the wrecking of the world’s environment for future generations. The current administration is obviously trying to do all in its power to roll back environmental and climate progress, and everyone who can should take a stand against it. It is possible to invest wisely in real green energy and receive good financial returns; divestment from fossil fuels need not be a money-losing proposition. Divesting from fossil fuels does not mean divesting from every evil (much as I would like to see that happen); this one is different. This one is about the future of the world and generations to come. As someone who grew up under the shadow of the threat of nuclear war (still present), I now find myself living under the certainty of present and worsening environmental disasters. It is my fervent wish that none of the world’s children should have to grow up with those threats and realities hanging over them.